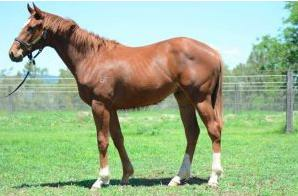 SHOW A HEART (AUS) (Chestnut 1997-Stud 2002). 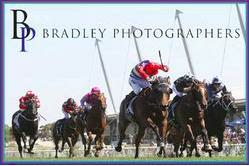 6 wins-3 at 2, VATC Caulfield Guineas, Gr.1. Leading NZ Sire of 2YOs 2006-07. Sire of 796 rnrs, 528 wnrs, 24 SW, inc. Heart of Dreams (VRC Australian Guineas, Gr.1), Toorak Toff, Woorim, Mimi Lebrock, Luke's Luck, Vo Heart, Rightfully Yours, Gotta Have Heart, Royal Tithe, I'm Your Venus, Super Ninetyseven, Crossyourheart, Heart Ofthe Desert - Hostwin Donatello (Mac. ), Dual Chamber, Fifteen Carat, etc. Prussian Heart (g. by Show a Heart). 5 wins-1 at 2-from 1000m to 1800m, A$139,650, BRC Kendrick Racing H., Sky Racing World 2YO H., Ipswich TC City of Ipswich H., 2d BRC Canadian Club 2YO H., Gallopers Sports Club H., 3d BRC JAHM H.
Red Bowers (g. by Show a Heart). 9 wins at 1000m, 1200m, A$149,550, to 2017-18, 2d BRC Ascend Sales H., Ipswich TC Civil Pro H.
Equal Luck (g. by Bradbury's Luck). Winner at 900m, 2d Ipswich TC Sirromet H.
Show Peace (f. by Show a Heart). Winner at 1000m in Aust. Evil Cry (Street Cry). 2 wins at 1200m, A$100,060, in 2017-18, 2d MRC Schweppes 2YO H., 3d VRC Taj Rossi Series Final H., L, Eugene Gorman 2YO H., 4th SAJC Morphettville Guineas, L.
Lonhmacc. 3 wins at 1200m, MRC Appelles H.
Eat My Trust. 4 wins from 1200m to 1600m, A$114,000, in 2016-17, BRC CMG Plaster H., 2d BRC Amgrow P.
Sovereign Spider. 4 wins from 1200m to 1800m, BRC XXXX Gold P., 2d BRC Coalscan H., SCTC XXXX H.
Tender Truce. 3 wins. See above. Takings. 3 wins at 1200m, 1500m to 2016-17 in Aust. Daddy Longlegs. 2 wins at 1200m in Aust. Oneredtwored. Winner at 1400m in Aust. Canny Con. Winner at 1200m in Aust. Don't We Love It. 7 wins-1 at 2-to 1500m, A$152,910, to 2016-17, Devonport RC Birdcage Tavern H., MRC Buyaracehorse.com.au H., TTC Neil Buckby Landrover H., 2d Tasmanian Farmer H., Devonport RC Bird Cage Tavern & Functions H., Birdcage Tavern & Function Centre H., Tasracing.com.au H., 3d Devonport Racing Club H.
Golfing. 8 wins to 1200m, A$122,425, to 2017-18, 2d BRC Giddy Up Club H., MRC (Mornington) Musk Creek Farm P., 3d BRC Doreen Bird H.
Money Spider (Sovereign Red). 2 wins. See above. Jobiton - Latin Lad (Mal.). 4 wins at 1200m, 1600m in Malaysia and Singapore, Singapore TC Lucky Cup, Class 2 H., 2d Singapore TC Class 1 H.-3 times, Class 2 H., 3d Singapore TC Class 1 H.-twice. ABBI'S CHOICE (Slewacide). 19 wins to 6½f, US$379,181, Fair Meadows Tulsa Sprint S., L, Remington Park Autumn Classic H., L.
JOAQUINHA (Country Doctor). 5 wins. See above. DR. PANGARITO (Country Doctor). 7 wins in Argentina, La Plata Handicap Libertad, L, 2d San Isidro Clasico Pippermint, Gr.2, 3d San Isidro G.P. Suipacha, Gr.1, Handicap Saint Wolf, L.